This project has been dismantled waiting to be refashioned for well over two years now, but it is finally done. Don't you just hate it when you find a skirt you love in a charity shop, but it is several sizes too small, why are all the cute things in a size 8 or 10 (UK sizes that is)? I love the print on this skirt, I actually bought it new in a different colour way from H&M many years ago, but there was no way a size 8 was ever going to fit me. I think I must have originally bought this skirt with the idea of making a bag, but all that happened was I ripped the skirt apart and put it in the deep dark recesses of my fabric stash, until it finally saw the light of day last week. 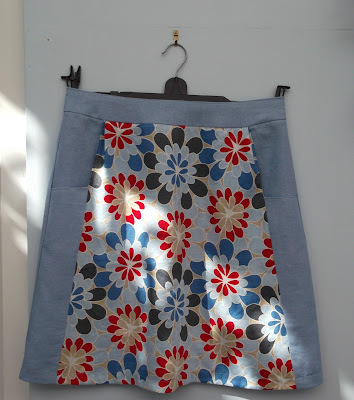 As I also found some pale blue linen in my stash, I decided to make a panelled skirt. 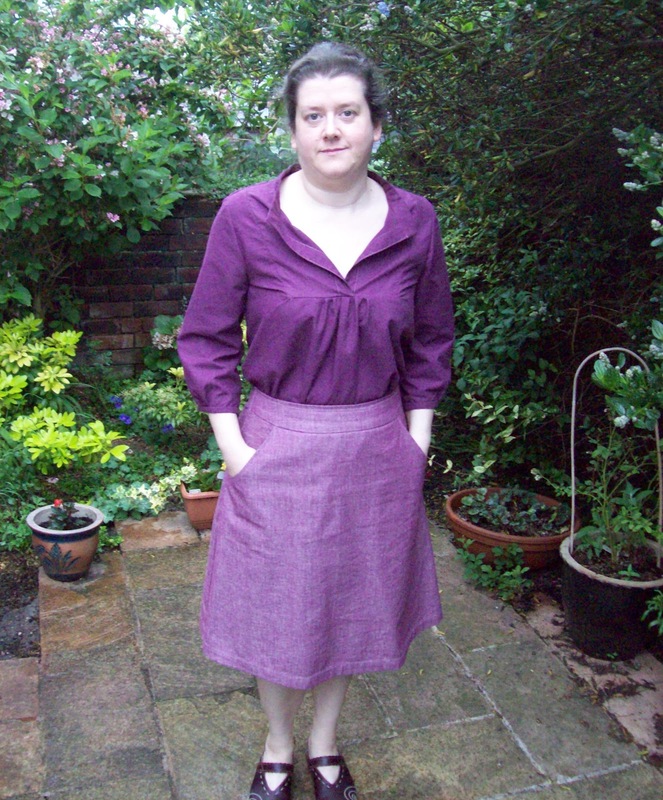 Of course I modified New Look 6106, which has been my go to pattern this summer (this is now the fifth iteration and I still haven't made the skirt up as it is meant to be). I worked out the largest panel I could get from the skirt as was and worked out how big I need to make the side panels. I then redrafted the pocket opening to fit with the side panel width, the original pocket opening is quite wide and shallow, I made it narrower and deeper to fit. The only other change I needed to make was the addition of a button and buttonhole. 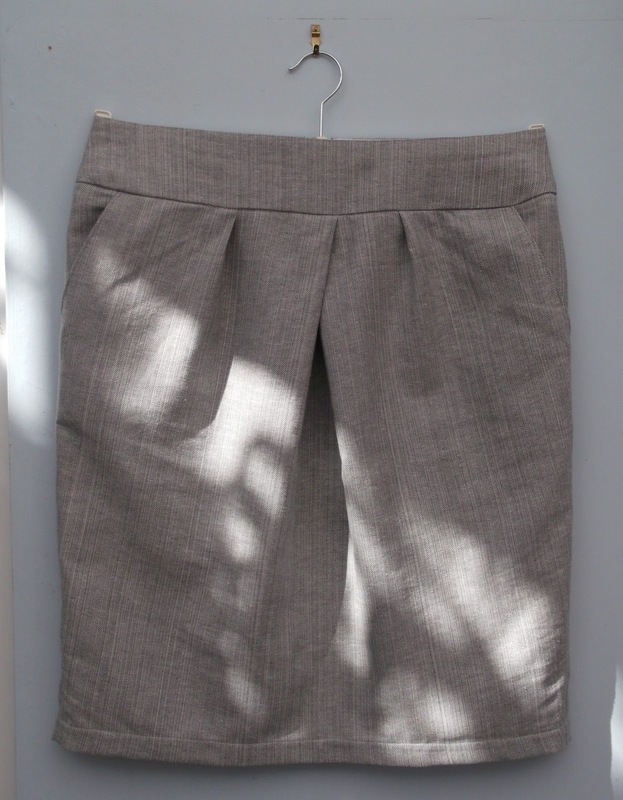 The pattern calls for the zip to go to the top of the waistband, but as I wanted to utilise the existing zip in the skirt (really why make extra work for yourself) I extended the waistband at the back and added a button. So from a skirt that was never going to fit me, to a skirt that fits very well, is a one off and will go with lots of t-shirts I already own. But again I ask, just why did it take me so very long? So there is very little point having a self imposed "Sew Spend Stoppage" if I don't actually start using what I already have; stash busting is the main aim after all. So I had a rummage (literally, my fabric stash is not the most organised) and found some patterns and fabric that had been waiting to be utilised for far too long. 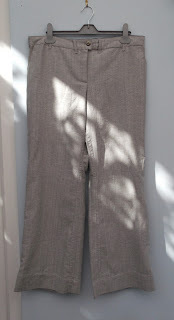 These trousers are from an issue of Knipmode I bought when we were on holiday in the Netherlands back in 2007 - Mei 2007 Broek 10b. So it has only taken me 5 year to make them. The fabric is a cotton/linen mix I think, bought at the Shuttle in Shipley last year, so that hasn't actually been hanging around too long. Apart from having an excessively large hem, these trousers came out very well and I have already cut out another pair to make. Fortunately I didn't need to follow the instructions in order to make up these trousers, as my ability to read Dutch is very limited. So I've come to the Tulip skirt a little late, but now that I have a really like it. I'm not pear shaped, so I don't have issues with extra volume at the hips, so I don't know why I didn't embrace this style sooner. 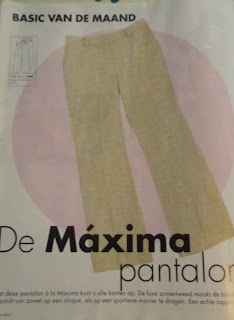 Again this is an old pattern, Burda World of Fashion September 2007, 116b. 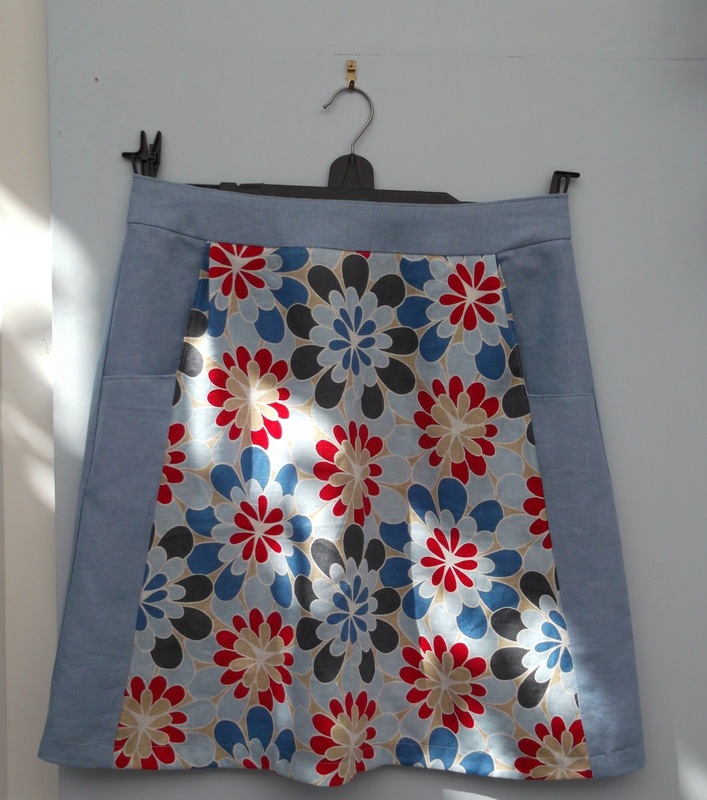 I had some of the blue/grey cotton/linen left over after I had made the trousers, so I decided to make this skirt. 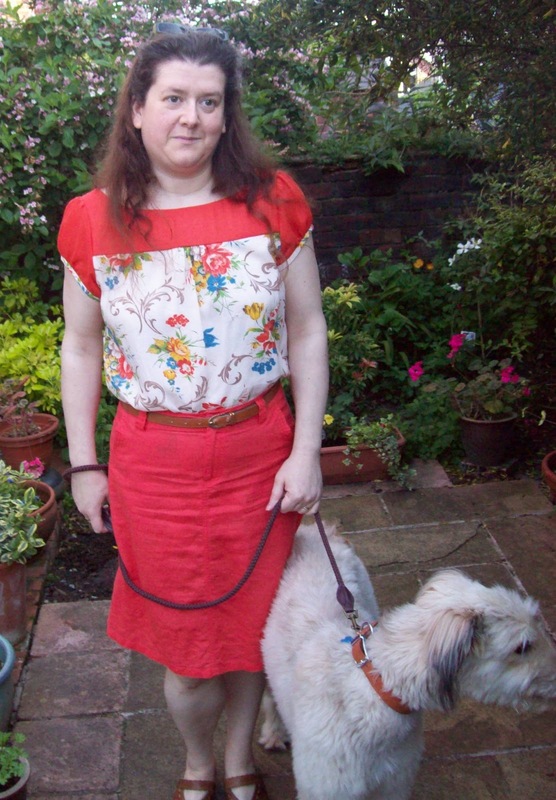 It is a really easy to wear skirt, it has pockets which I always love. I lengthened the skirt a little as I knew I would want to wear it without tights and as I have be insanely clumsy all my life my knees are just a mass of scar tissue, I needed the skirt to be a tad longer. Just a few more picture from our early morning sojourn with Handsome Hagrid. Why did it take me so long to make this t-shirt? So I started this t-shirt at least 2 years ago and by started I mean, I bought the pattern (downloaded actually as I had to have it immediately) and acquired 2 charity shop t-shirts to refashion. And then nothing. Fabric and pattern sat in a bag, somehow migrated up to the attic and waited for me to find then again. And that happened on Tuesday. Apologies for the really bad photo, it is a very grey rainy day here. 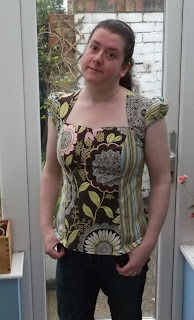 So I traced it out and cut it out (that was fun as the pattern says you need 1.5m of fabric and I had two not massive t-shirts) and sewed it up yesterday. In hindsight I probably would have been better off testing this pattern out with regular fabric rather than trying to refashion two too small t-shirts, but we live and learn. The fabric I used for the body, should have been a little drapier, the cowl just doesn't drape. But I actually prefer it without a cowl. The shawl should have been cut from a double layer of fabric and folded in half, but I just didn't have enough fabric. So it is cut from a single layer and the front edge is hemmed and would probably drape much better if sewn as intended. I don't know how I actually managed to line up the striped between the sleeves and the shawl collar, it was completely unintentional, a fluke if you will. However, there was absolutely no way the sleeves were going to fit into the armhole, hence the puffy sleeves. This is a simple pattern to make (the foibles of jersey fabric not with standing) and I will definitely make it again, although I try to remove the drape of the cowl all together and reduce the size of the sleeves so they actually fit. So I really don't know why it too me so very long to make. Back in March I asked my Mum what she wanted for her birthday and she said I could sew some things for her. So I refashioned a dress into a skirt and then Minnie became ill, so I didn't get anything else done in time for Mum's birthday. That was 3 months ago, but as I am now back in the sewing swing of things, I decided I should probably make good on my promise. 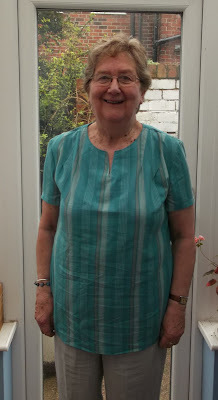 However, I didn't tell Mum beforehand that I would want to blog about my sewing for her and that that would require a photo. Here she is the new top, the pattern is Simplicity 2371. If was quite a straight forward pattern to make, I made a few minor alterations. I shortened the notch at the front and shortened the sleeves and put in small side vents. Mum seems to like it. I think she would quite like me to make her the trousers now. In recent months I have discovered how often it is lovely at six o'clock in the morning and by 9 o'clock it can be grey and miserable. 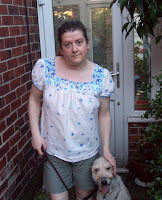 Mr Fluffrick and the lovely Hagrid on our early morning walk. There were lots of wonderful smells this morning and we got Meersbrook Park all to ourselves. I wish the weather would make up it's mind. Is it going to be cold miserable and grey, or lovely and sunny as it has been today? Do I want salad or a nice warning bowl of spaghetti? Weather won't you please make you mind up, so that I can decide what to eat. Anyway this is the menu, provided the weather doesn't make to dish too inappropriate. Pizza - I do most often make my own pizza, but instead we ordered in the lovely pizza from Nibbles the best pizza in Sheffield. Sushi - I have never made sushi at home before, it took a bit of trial and error to make up the sushi rolls but it seemed to work okay. It also involved a trip to the local Oriental food shop. Moussaka - this is in no way a traditional moussaka, for a start I use turkey mince, but it is tasty not the less. Mezze - Falafel, Foul, Bulgar Wheat and any other dippy, picky thing I can think of. Mushroom and Stilton Pie with new Potatoes and vegetables. Stirfry Vegetables, Noodles and Potsticker dumplings. Spaghetti with Walnuts and Crumbs. So I've had this pattern so long that it is not discontinued. This is Amy Butler Lotus Tunic (not the perfect tunic because it required a zip or buttons), made up in two different but coordinating Amy Butler cottons (now discontinued I as well I think). The fit is really good on this pattern, it didn't require any adjustments. Once again I have found the yardage requirements on a pattern truly ridiculous How could a simple fitted top require 2.5 metres of fabric?. With a few minor adjustments to the layout I got this pattern from only 1 metre of fabric. 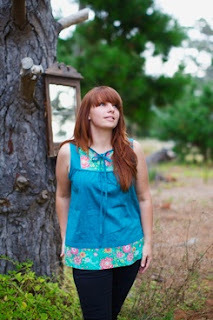 I will definitely be making this pattern again, although the sleeves are a little puffy and I may need to tweak them. I am on a quest for the perfect tunic pattern. A quest and a pledge in one week, Fluffrick's current fantasy readings are obviously having a disturbing influence on me. 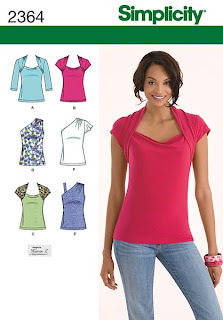 I just want a little top, that is relatively relaxed but just a bit smarter than a t-shirt. Is that too much to ask? 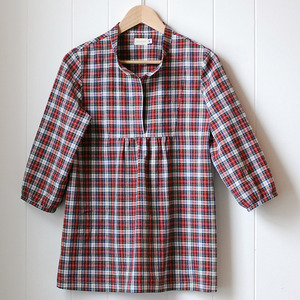 I do like the Tova top from Wiksten. I have made it twice since I bought the pattern back in May. But I was wanting something short sleeved and that doesn't need to be worn tucked in. 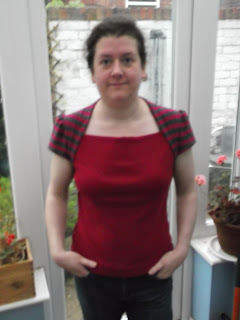 The pattern for the Poppy top by Make it Perfect also appealed, I really like the contrast yoke and border, but it is sleeveless and the neckline is a little high. Oh and I'm not buying any patterns at the moment. These are three different tunic that I have made in the past and I like them all, but none of them are quite perfect. They all just seem to be too full in the front, but they need to be loose enough to put on without having to insert a zip. If I have any joy in my quest (without buying a new pattern of course) I will be sure to write about it here. So at the end of Me Made May'12, I made a half-arsed pledge to stop buying sewing more patterns or fabric and use what I already have. I didn't give myself any guidelines, any kind of time-scale, just a maybe I shouldn't buy more stuff. And as a consequence I went the following days and bought Sew magazine, because I liked the Lisette pattern that was included free with it (hardly free as the magazine costs £5.99). Now it's a nice enough magazine, like the dozens of other sewing magazines I have bought and kept and hardly ever made anything from. It was a typical sewing impulse purchase and when I got the pattern home and had a closer look I felt less and less likely that it would be a pattern I would make a great deal of use out of. But with my new ethos fresh in my mind I have actually used this pattern and this is the result. 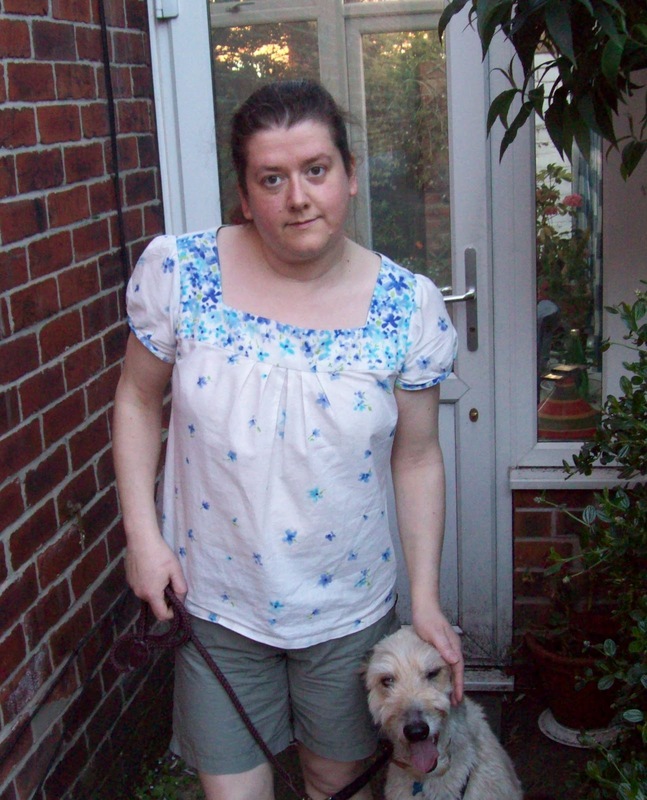 I cropped the dress to make a top instead, the check fabric is a remnant from a shirt I made Fluffrick several years ago and I also used it to make my own bias binding. The plain fabric I bought when we went to Bradford and blogged about here. I even had the perfect colour of cotton already in my stash. So mostly stuff I already had, but the purchase of a new pattern none the less. So here is what I pledge. For the remainder of 2012 I, Katrina of RollingEyeballs, will not purchase any new patterns, fabric, notions or sewing magazines. I will use what I already have and I will only purchase haberdashery if it is essential to the completion of a garment. We can just overlook the bag of 27 zips that I bought at Oxfam in Buxton for the princely sum of £2.99, how could I pass that up? Right off I should say I hate going to the supermarket. I am not one of those people who is happy to trawl around several supermarkets just to find the best bargain. I love watching Extreme Couponing (not that you can get such deals in the UK) but the notion of spending eight hours or more in a supermarket makes my blood run cold. So just how do you go about cutting your food bill (without cutting quality). The lovely Fluffrick and I have spent many a Friday night (we know how to live it up) wandering aimlessly around Sainsburys putting stuff in our trolley, getting to the checkout and having very little to make a meal from. If you know what you are going to eat, you can plan what you are going to buy. This may seem obvious, but it is something I have only started to do within the last year or so. It means you will get all the ingredients for all the meals you have planned and if you happen to put Chocolate on the list then you will just have to buy it. Having a list does not mean you will never make an impulse purchase, but it will mean you will buy what you need. I know not everyone will approve of this notion, but meat is expensive especially if you want to buy higher welfare meat (as I do). Meat Free Mondays is a fantastic idea (although personally I don't find Mondays a good day as it is the only day we are likely to have leftover chicken). Just one day a week will save you money, but we now have 3 or 4 days a week meat free (sorry Mum) and it has definitely had an impact on what we spend. I have found that the more spice you have the less you miss the meat, try a mushroom curry and lovely dahl and gobi aloo with naan bread and see if you miss the meat. If you have made a menu and written a list, you shouldn't end up with a fridge full of things going out of date or spoiling. I like to buy apples and bananas, but invariably don't always get them eaten before they start to go a little sad, but don't bin them, make an Apple Cake or Banana Bread. Love Food Hate Waste is a great resource for ideas to use up leftovers and to guide you about not making too much to begin with. Today (well everyday this week actually) the lovely Fluffrick will be having Spiced Couscous with Vegetables, last week he had Brie, Cranberry sauce, salad and a homemade bread roll, next week it might be spicey bean tortilla wraps. It costs a whole lot less to make you own lunch than to buy a sandwich everyday. There is nothing earth shattering here, but there is no doubt it is saving us money. We could undoubtedly save even more money if I was willing to cut down on quality. I don't really "do" brands, that doesn't say quality to me, shop own brands are fine with me. To me quality is buying high welfare meat, sustainable fish and organic or locally produced fruit and veg. It does pain me to say that the way to save money is to plan, a menu, a list and the eat what you buy. The added bonus of using a shopping list is that I can get round the supermarket a whole lot quicker and that is always a plus to me.